Take your home theater to a whole new level with this HD-compatible projector that delivers excellent color saturation and subtle details for superior image quality. It's perfect for movies, sports, or TV shows -- anything you want on a big screen from 60 to 100 inches in size in the comfort of your home. 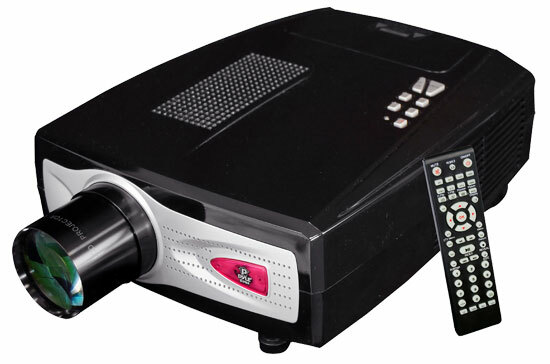 It's compatible with almost any source you throw at it -- RCA video, S-video, VGA, component video, and digital RF, supporting signals up to 1080i resolution.With an 800:1 contrast ratio and 1800 lumens, this projector displays images so crisp, you'll become fully immersed in whatever you're watching. The lamp lasts up to 8000 hours for a long life. Review : Lamp comes on for a second and turns off. mOne minute or so later comes on again for a second and goes out. This process repeats and repeats.